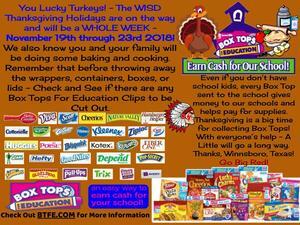 The WISD Holidays will be November 19th through November 23rd 2018 - A Whole Week! All WISD Campuses and Classes will resume on Monday, November 26th 2018. Have a safe and yummy Thanksgiving! Since Veterans Day (November 11th) falls on a Sunday this year, the Third Graders will be having their Veterans Day Program on Thursday November 8th (For the Students) and on Friday November 9th 2018 (For Everyone Else). Each morning the program starts at 9:30 AM. Veterans are more than welcome to attend on both days. 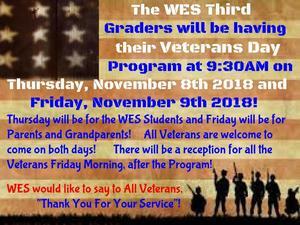 On Friday, there will be a small reception for the Veterans at WES, after the program. 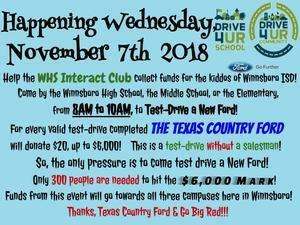 Come to the Campuses to Drive For Your School and earn funds for the WISD Campuses on Wednesday, November 7th 2018. 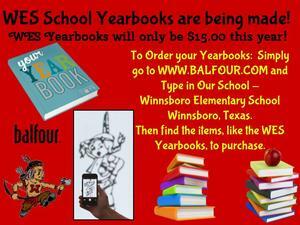 To order your WES Yearbooks simply follow the steps when going to Balfour.com. WES Yearbooks are only $15! 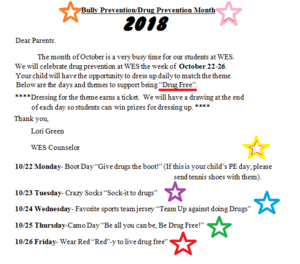 During the week of October 22nd through October 26th WES will be Celebrating Our Stance Against Harmful Drugs - Just Say No! 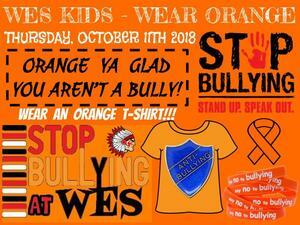 Each day the students and staff will be dressing up in support of being Drug & Alcohol Free! Each day your student dresses up they get a ticket and can win a prize at the end of the day! 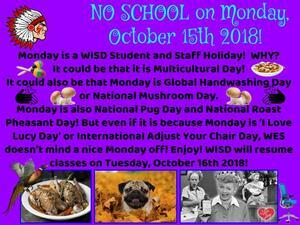 No School for WISD on Monday, October 15th 2018! 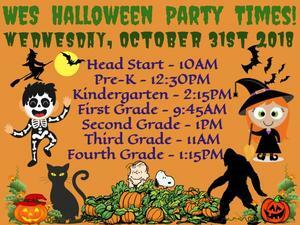 There are many things going on at WES during the Month of October. We want everyone to be involved in Saying NO to Bullying and to Harmful Drugs. Here is some great information on the upcoming activities and events this week and the following next few weeks from our WES Counselor Mrs. Lori Green.